Cuban human rights activist Alexander Roberto Fernandez Rico was arrested in April 2012, and sentenced to three years in prison after he started shouting anti-Castro slogans when he witnessed a police officer beating a passenger on a bus. Almost immediately after his imprisonment, Fernandez started a hunger strike that left him blind, according to a report posted at PayoLibre.com. Instead of releasing him, officials at the Combinado del Este prison in Havana transferred him to an infirmary. But on Feb. 2, after Fernandez complained about the quality of care he was receiving, he was ordered removed from the infirmary, according to the report, which was based on information provided by Cuban lawyer Juan Carlos González Leiva. "At present, the prisoner of conscience does not have the minimum conditions required by someone who is blind. he even has difficulty relieving himself,," Gonzalez said. "I demand the authorities reconsider their case, and for public opinion to show the solidarity Fernandez Rico needs." UPDATE, Nov. 16, 2011 -- Six of the seven prisoners were released in November 2011. Leave it to the Castro dictatorship to twist the language to enforce its repression of the peaceful opposition in Cuba. On Wednesday, September 7, 2011, the families of the seven members of the Cuban Resistance who were violently arrested on August 28, 2011 in the city of Palma Soriano, were told by Castro regime officials that the activists will be jailed in what they referred to as "provisional incarceration." The activists, who belong to the Orlando Zapata Tamayo National Civic Resistance Front and other resistance organizations, were beaten before being arrested during a raid on the home of opposition member Marino Antomarchit Rivero, where activities were taking place in support of the Ladies in White. That activity counted on the participation of several resistance organizations in eastern Cuba, among them the Patriotic Union of Cuba. According to eyewitness accounts, repressive forces launched tear gas canisters through the window of the home and then entered wearing gas masks while the home's inhabitants were coughing and vomiting due to the effects of the gas. The provincial prosecutor for Santiago de Cuba has issued a prison order for Miguel Rafael Cabrera Montoya, Alexis Kuan Jerez, Víctor Campa Almenares, Nivaldo Amelo Ramírez, José Enrique Martínez Ferrer, Alexei Aguirresabal Rodríguez and Bismarck Mustelier Galán, alleging they are guilty of public disorder and creating a public commotion that "obligated" the police to intervene. This account is a fabrication that is being used at this moment to build a case for an unjust trial without due process for these peaceful defenders of human rights in eastern Cuba. An admirable quality of many in the Cuban opposition is their selfless concern for their fellow man. As opponents of the Castro regime, they face many dangers but they never forget about those Cubans who might have it worse -- like those Cubans imprisoned in the Castro gulag because of their political views. For example, members of the opposition Republican Party of Cuba (PRC) gather each month at a Catholic Church in Old Havana to pray for PRC activist Lázaro Marlon Mesa Romero, who has been in jail since May 2010 when he was arrested during a street protest. After Mass on July 24, the activists took their demands to the street. UPDATED, Dec. 27, 2011 -- Yordanis Martinez and Walfrido Rodriguez were released as part of a Christmastime mass parole. UPDATED, June 10, 2011 -- Political prisoner Walfrido Rodriguez started a hunger strike June 5 after his jailers told him he would have to wear the uniform of a common prisoner. Four Cuban dissidents were sentenced to up to 5 years in prison after they were convicted of distribution anti-government leaflets in Havana. Luis Enrique Labrador, 33, David Piloto, 40, and Walfrido Rodriguez, 42, were sentenced to 5 years; and Yordanis Martinez, 23, was sentenced to 3 years in jail. The men were convicted on charges of "conempt" and "public disorder." An official document addressed by the state prosecutor to the Criminal Court of Havana, a copy of which was obtained by Human Rights Watch, said the four were detained on January 14, when they went to Havana's Revolutionary Square and threw leaflets into the air with slogans such as "Down with the Castros." When agents of the National Revolutionary Police arrived at the scene, the four men sat down on the ground, an act the prosecutor deemed "a defiant and provocative attitude...that interrupted the traffic flow." Martínez was sentenced to three years in prison, while the other three were each sentenced to five years, according to their families and human rights defenders in Cuba. Family members told Human Rights Watch that state security agents had visited their homes the day before the trial, warning relatives that if they "created a scene" and called attention to the hearing, the detainees would be left in pretrial detention indefinitely. One man's mother said she was fired in April on the grounds that she was "the mother of a counterrevolutionary." The families also told Human Rights Watch that Martínez and Piloto went on hunger strike in May in Valle Grande prison to demand they be put on trial. In response, they later told their families, they were handcuffed and beaten by a prison official. In a taped interview with a Cuban human rights defender, Juan Carlos Gonzalez Leiva, which was later replayed for Human Rights Watch, Rodríguez called the trial a "a mockery." He said the judge simply rubber-stamped the prosecutor's recommended punishment, ignoring the defendants' arguments in their defense. Elizardo Sanchez, the director of the Cuban Commission on Human Rights and National Reconciliation, an independent human rights group not recognized by the Cuban government, told Human Rights Watch that state security agents surrounded the local courthouse where the trial took place, preventing human rights defenders and other members of the public from attending. Cuban human rights activists have called for Amnesty International to recognize the four men as prisoners of conscience. "They did not commit any criminal act, they didn't place bombs or attack anyone. They only protested for their ideals," Vidiet Martinez, brother of one of the prisoners, told Reuters. The trial sparked an anti-government protest outside the courthouse. Tuesday's court action brings to six the number of dissidents sentenced to prison during the last week of -- suggesting, perhaps, that the regime is back to sentencing its opponents to lengthy prison terms, instead of just short detentions, according to prominent human rights activist Elizardo Sanchez. Their father, the independent journalist Marcos Antonio Lima Dalmau, said the two were arrested on December 25, 2010. Lima Dalmau, who was allowed to attend his sons' trial, said they were accused of insulting national symbols and causing public disorder for allegedly dancing naked in front of their house, and spitting, urinating, and stepping on a Cuban flag, which both denied. Human Rights Watch believes that the charges were fabricated to prosecute the brothers in retaliation for their human rights work. Lima Dalmau said that one of the witnesses who testified in their trial - a neighbor - said he had accompanied police when they inspected the brothers' home, and had seen the flag hanging undamaged on a wall. Cuba's laws empower the state to criminalize virtually all forms of dissent, and grant officials extraordinary authority to penalize people who try to exercise their basic rights. The Cuban Criminal Code penalizes anyone who "threatens, libels or slanders, defames, affronts or in any other way insults or offends, with the spoken word or in writing, the dignity or decorum of an authority, public functionary, or his agents or auxiliaries." The violations are punishable by one to three years in prison, if directed at high ranking officials. Such laws violate the right to freedom of expression recognized in article 19 of the International Covenant on Civil and Political Rights - signed by Cuba in 2008. Cuban dissident Raumel Vinajera was released from prison this past Feb. 22, after two years of unjust imprisonment. The Castro dictatorship, however, has not forgotten him, and in fact, seems hellbent on finding a way to return him to prison to retaliate for his renewed activism against the regime. A trick within the Cuban juridical system may put Raumel Vinajera Stevens back in the jail he was released from under conditional freedom during last February 22nd. In a phone call I made to his wife, Tania Montoya Vazquez, both told me about the trap which Major Diorkis, said to be the chief of Confrontation against the Enemy in Santiago de Cuba, is preparing against him. I’ve spent some nights now trying to talk to the wife of Ariel Arzuaga, a defender of human rights in the city of Bayamo, in Granma province. He is currently imprisoned because of the malice of the local military authorities. Yakelin Garcia Jaenz worriedly told me that Ariel remains in a very poor state. He is now confined to “Las Mangas” Provincial Prison, and being kept in the area of those who have pending trials. He is being accused of “assault”. Ariel Arzuaga’s suffering began on February 23rd of this year, 2011, when he was on his way to pay tribute to the memory of Orlando Zapata Tamayo. “We had a funeral garland in the house, but the political police agents Julio Cesar and Abel violently barged in. They tore down the door and told us that we were not allowed to leave our house. That’s when Ariel went out to the street and told them what they were doing was a violation because there was a child in the house that had to go to school and they were stripping that right from us”. “I ended up taking my son to school and they took me to prison. Ariel stayed at home taking care of our 2-year-old daughter and they started to accuse him. They were saying that he wanted to kill our girl, which is a huge lie. The Special Brigade entered our home through the bathroom window and seized Ariel. They twisted his arms in a lock position, they grabbed his neck, and then dragged him to the MININT Delegation located on the road to Santiago de Cuba. At midday, they moved him to the Instructional Police unit where he was kept until March 11th, where he declared himself on hunger strike from March 9th”. “On March 14th, while he was out on the street again, he tells me that around 5 pm he was verbally and physically attacked by a paramilitary officer who had also been present during the February 23rd demonstration when he was detained. This man really attacked him and screamed at him: ‘Worm! Counter-Revolutionary!’ and other obscene words. Ariel, according to what they tell me, simply got off his bicycle and that’s all. He was later detained on March 17th and has been behind the bars to this day, which is soon going to be a month exactly. He has been kept in the Las Mangas jail in Detachment 1-2″. “Today, I got to visit Ariel there. He told me that Major Joel had informed him that he could no longer use the phone every three days as is the norm established for common prisoners. They also informed Ariel that family visits will no longer be held in the salon but somewhere else and separately”. Ariel Arzuaga Peña lives in 21 Street, No. 12-A, e/12 and 14, in the Ciro Redondo Housing Complex, Bayamo, Granma. He is the director of the local “Light and Truth” Human Rights Center and is the President of the Opposition Municipality. He is also an activist of the Eastern Democratic Alliance. UPDATED, June 12, 2011 -- Prison officials recently denied Arzuaga a visit with his wife, mother and sister. The Catholic Church had a role in the release of more than 100 political prisoners, even if it only amounted to making a phone call to the prisoners and informing them that there was for them a seat on an airplane waiting to take them to exile in Spain. But not all political prisoners, apparently, were deserving of the church's intervention, as human rights activists say there remain some 60 or more political prisoners in the Castro gulag. One of those men, one of those prisoners apparently forgotten by the church, is Augusto Guerra Márquez. Ironically, Guerra was arrested and imprisoned in 2006 because of his leadership of an opposition group called the New Catholic Party of Cuba. He is currently serving prison sentences adding up to 10 years. This week, Cuban independent journalist Damián Sánchez Sáenz reported that a "re-education" officer at the Agúica prison in Matanzas had blocked delivery to Guerra of a package of medications brought to the prison by a family member, Gerardo Lazacano Naranjo. The officer said Lazacano would have to return in a few days so that he could be questioned by the prison warden — something that Lazacano said would be impossible because of the expense of traveling to the prison. Lazacano said the medications included vitamins, cod liver oil pills, antacids and allergy medicines. UPDATED, March 5, 2012 -- Alfredo Calzado was released from prison in February 2012, after serving 10 months. Cuban human rights activist Alfredo Calzado García last week was convicted of "disrespect" and "resistance" and sentenced to 18 months in prison. Calzado was sentenced on April 5, three days after he was arrested and three months after he completed a 2-year sentence for being a "pre-criminal social danger." Calzado's wife said Cuban State Security had been looking for a chance to again punish Calzado. When agents moved to arrest him, he fell to the ground, started singing the national anthem and yelling, "Long live human rights!" The thugs responded by beating him so severely, that he was left urinating blood. Independent journalist Jesús Alexander Almaguer reported that Calzado had only 10 minutes to speak with a lawyer before his "trial." 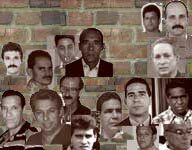 The release of the remaining Group of 75 prisoners of conscience from the "black spring" crackdown of 2003 provides an opportunity to refocus on the plight of other political prisoners in the Castro gulag. Attention on their suffering is as vital as it was for the Group of 75, so that they — and their captors — know that they are not alone and that they are not forgotten. One of the longest imprisoned political prisoners is Rafael Ibarra Roque, who has been jailed since 1994. The co-founder of the Frank País November 30 Democratic Movement, he is currently being held in the Combinado del Este prison. Recently, human rights activists around the world have drawn new attention to Ibarra's case, noting that under Cuban law he should be paroled because he has served 17 years of a 20-year sentence. Of course, in Castro's Cuba, the law doesn't mean anything. Men like Rafael Ibarra Roque, imprisoned in Fidel Castro's gulag since 1994, will one day lead a free Cuba. Whether in or out of prison, their vision for the country is surpassed only by their virtue. Ibarra, now 48, was in 1991 a co-founder of the Frank País November 30 Democratic Movement, and in 1992, was elected president of the group. On June 17, 1994, he was arrested and accused of "sabatoge." Despite no evidence being presented, eight months later Ibarra was sentenced to 20 years in prison. Ibarra was born at the time of the revolution, in June 1959. He was destined, because of his age, to be a product of the “new man,” whom the Communists tried to form, a type of robot who would respond to all their commands. The ambience in which he was immersed, along with his schooling, books, the press, television, were geared toward indoctrination. Nevertheless, he was impenetrable to deceptive messages. At a young age, he showed signs of thinking for himself and of his love for liberty, like something inherent in a human being, and his love of democracy as a political system. This is a trait of Cuban country folk, who have a glorious history in the wars of independence and who were the first to rebel against Castro. Suffice to say that it took thousands of men and huge quantities of resources for the tyrant to wipe out the guerrillas of Escambray. Ibarra helped found the Democratic Party 30 of November in the 1990s and became its president. The organization of political parties and independent organizations on the margin of the law, under persecution and terror like that which has existed and still exists in Cuba, is extremely risky and merits the recognition and sympathy of everyone. His new position as head of the Party placed him under the scrutiny of the authorities, who quickly found a pretext for jailing him. They accused him of sabotage, which they were never able to prove, and of which he declared his innocence. Nonetheless, he was sentenced to 20 years in prison in 1994. Apparently the sentencing of an innocent person is but a game or something similar to counting sheep before going to sleep. The calvary of this sincere married man, who worked on his farm in San Miguel del Padron, began from the time he was detained at Villa Marista for several months for interrogation. While there, he was tortured so he would declare himself guilty of sabotage, which he did not commit, given that the party he represents is pacifist and is against terrorism. He lost 50 pounds because of this. From Villa Marista, he was transferred to Combinado del Este Prison. Do you know why he was condemned to solitary confinement? For having wounded a guard? For having a concealed weaponor attempting to escape? No, even though these are valid reasons when one has an unjust sentence. He was condemned for having kept in his cell a copy of information from the Special Investigator of the United Nations! The Cuban government should openly come clean with the number of citizens incarcerated without probable cause, or due to fictitious charges and sanctioned to long prison terms. Also, they should publicly acknowledge, the number of cases presently under revision after years of unjust imprisonment because most of the arguments and proofs simply point to the individual's innocence. All Cuban prisons are plagued with cases of innocent individuals who bare witness to the fact that in Cuba, prison sentences are handed down by police instructors prior to trial. Incredible as it may seem, the most innocent of all individuals in this Country can be sent to jail for no apparent reason. No apparent reason, that is, except for that they want to be free. One day, perhaps very soon, they will know their suffering was not in vain. UPDATED, 8 p.m. EDT — Néstor Rodríguez has not decided whether to accept exile, according to his family. UPDATED, 1:50 p.m. EDT — The Catholic Church today announced that Néstor Rodríguez would be released and expelled to Spain. Prisoner of conscience Néstor Rodríguez Lobaina on Tuesday will stand 'trial' on trumped-up charges of "disobedience" and "disorderly conduct", the most notable of the Cuban opposition to be prosecuted since the "black spring" of 2003. Rodríguez, a leader and co-founder of the Cuban Youth Movement Democracy, was arrested Dec. 9 and is currently recovering from the effects of a lengthy hunger strike he started last month to force his release. He ended the protest after authorities set a trial date. Rodríguez's arrest, which came on the eve of International Human Rights Day, and subsequent imprisonment and prosecution belie the notion that the recent release of dozens of other political prisoners somehow means the Castro dictatorship has somehow changed its essential nature. The world must stand up and bear witness to the injustice set to happen on Tuesday — Cuban "justice" is anything but — and demand the immediate release of Néstor Rodríguez Lobaina and all Cuban political prisoners. Cuba Democratic Directorate has more, including information on the recent arrest of Rodríguez's brother Rolando. Read more, in English, here.